All parameters essential for functioning of the system are programmed by an installer on site and are memorized in the non-volatile memory, prevented from any power loss. 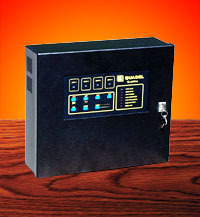 Control panel is compatibile with all standard types of fire detectors (smoke, heat, flame detectors), with two-zone dependency applied on the software level. Comprehensive auto-diagnostics feautures, with a both detecting and activating line integrity control, gives to this system a high level of reliability while operating. Panel is compliant with EN54-2, EN54-4 and EN 12094. Privredno društvo QUADEL doo 2016. All RIGHTS RESERVED.